There are a few things about Francesco De Sanctis that one naturally admires. He was a towering intellectual of the 19th century in Italy and is still recognized as one of the greatest scholars of Italian language and literature. (One of his students, Benedetto Croce, is also on that list of great men of letters). That's fine, yes, but we all know that there are fine minds who spend their time deconstructing puns in 18th-century French poetry who live in ivory towers while the world goes to hell around them; thus, there are a few other reasons to admire De Sanctis. De Sanctis was a precocious child, studied privately, and then went to high school in Naples. He then started his own academy, and his reputation as a scholar spread. His activities in 1848 landed him a three-year sentence in a Bourbon prison, where he promptly requested a German grammar book so he might learn German and translate Goethe's Faust into Italian. (That'll make three years fly by real quick!) He then went into exile in Torino, and his reputation as a lecturer on Dante brought him the appointment of professor at Zürich in 1856. He returned to Naples in 1860, shortly before the kingdom was taken by Garibaldi and annexed to the Savoy state of Piedmont-Sardinia to form modern Italy. He became the minister of public instruction for the new nation of Italy in 1861 and also in that same year became a deputy in the Italian chamber (i.e. a member of parliament). He served again as the national minister of public instruction in 1878 and 1879. At the University of Naples, he became its first professor of Comparative Literature. His writings encompassed much of European literature, from the distant Dante and Petrarch to his own contemporaries such as Zola, Leopardi and Manzoni as well as German philisophers such as Hegel and Schopenhauer. His philosophical writings include Art, Science and Life, and his monumental Storia della letteratura italiana (History of Italian Literature) was published in several volumes, some after his death. 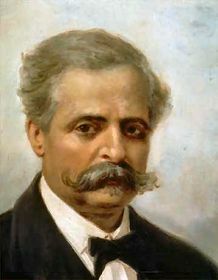 De Sanctis died in 1883 in Naples. "Gentlemen...if reaction comes, you can be assured that it will not openly announce itself as such. When it comes calling, it won't say, I am Reaction. Look at history; all reaction has used the same language —'we need real liberty, but for that we need to reconstitute the moral order and defend the monarchy from these small groups.' Those are their tired clichés, and we all know their history. Those are the trite words that reaction uses when it shows its face." I am not aware that De Sanctis' reputation as a scholar or defender of human liberty has diminished with time. His works are still read and highly regarded. His student and admirer, Croce, edited and republished some of De Santis writings in the early 1900s and in 1917 published a bibliography of De Sanctis' works in celebration of his one hundredth birthday. There are a few schools in Naples named for him and monuments in his honor. Finally, I did run into a person who said, "I don't like him." "He didn't like Leopardi, and I love Leopardi!" "Leopardi and Schopenhauer are the same thing. At almost the same time, one invents metaphysics and the other, the poetry of pain. Leopardi sees the world in a certain way and doesn't know why; Schopenhauer figures out why by discovering the Will." This is, as they say, above my pay-grade.